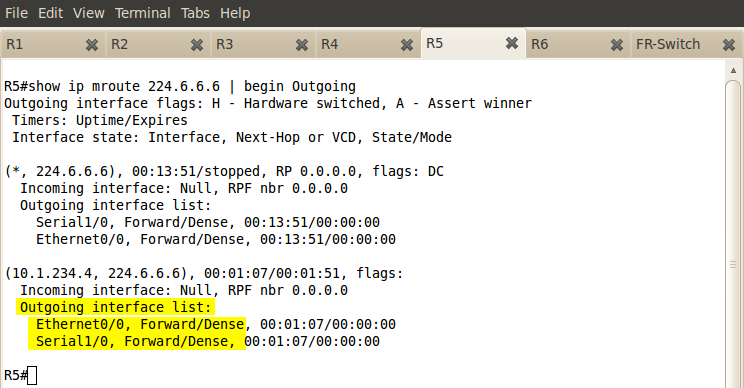 All routers have PIM Dense enabled on all their interfaces except for subnet (use R6's Et0/0). 10.1.51.0/24. The multicast clients on subnet 10.1.56.0/24 join 224.6.6.6 group. Ensure that multicast clients can receive feed from 10.1.234.0/24 (R4). 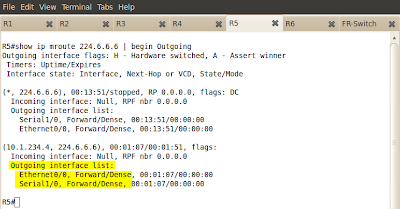 All routers have PIM Dense enabled on all their interfaces except for subnet 10.1.51.0/24. The multicast clients on subnet 10.1.56.0/24 will join 224.6.6.6 group (use R6's Et0/0). Ensure that multicast clients can receive feed from 10.1.234.0/24 (R4). Pic. 2 - Feed from R4 towards 224.6.6.6. The feed does not reach the subnet 10.1.56.0/24. The reason is the Reverse Path Forwarding check failure according to IGP routing between R1 and R5. Like in the previous lab, where reaching RP is a subject to RPF check, here R1 picks the path through 10.1.51.0/24 to reach 10.1.56.0/24. These interfaces are not PIM enabled. Pic. 3 - R1's Routing Table. 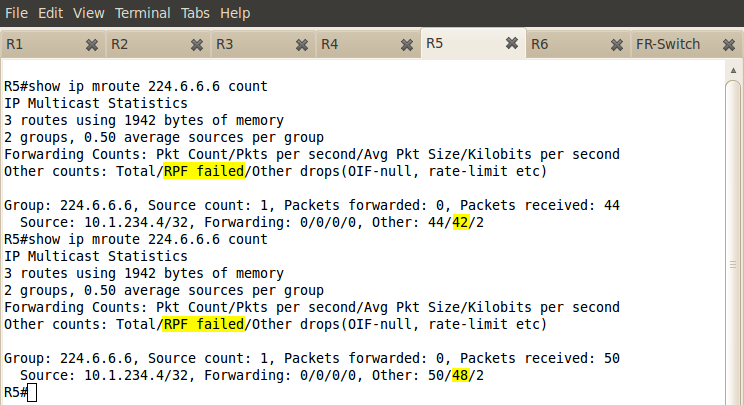 The RPF check fails since the multicast traffic arrives on R5's Et0/1 interface instead of Se1/0. Pic. 4 - R5's RPF Check Failure. Pic. 5 - R5's IOL List. In order to correct the problem, static mroute must be configured on R5. Pic. 6 - Multicast Feed Works. 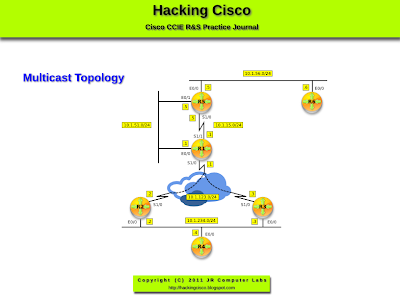 Cisco's PIM based multicast traffic as well as the reachability towards RP (Sparse-Mode), are the subject to RPF check.